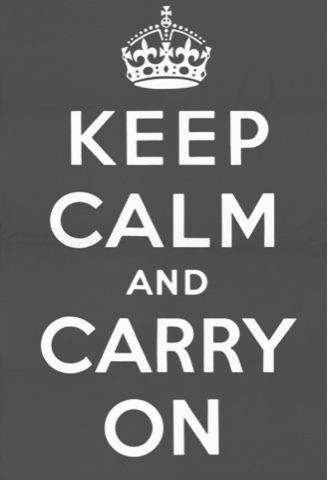 The slogan KEEP CALM AND CARRY ON appeared on a motivational poster in war times more than 70 years ago. Lately it has popped up as a widely used meme covering umpteen topics, from movies to politics to parenting to Internet culture. For me, today was the epitome of KEEP CALM. It seemed that my day had the faculty for turning sour at each and every turn. But what eventually followed continued to be enjoyable, if I let it. Which I did. Simply because I had an impressionable three year old watching me. Me. This painfully wounded and deeply scarred me. My motivation for Carrying On is that she won't also have the tendency to have fear as a default or to unremittingly stress or to desire to give up or to struggle not to judge. Nothing motivates change as effectively as hungering for more for your child. I want more for her than what I experienced with my self inflicted years of loneliness and the struggle with relationships. I want more for her than the expense I had to invest into counselling. I want more for her than the incessant negative self talk I had to reprogram. I want more for her than I am even capable of imagining due to where I started from. So when she was buckled into her carseat today and got locked in the car I kept my calm trying to get her to un-click a buckle she has never been able to operate. I feared the temperature would get too high and I felt like throwing up. I wanted to go home and hide. But I smiled at her and encouraged her and assured her help was coming. She cried. Of course. But I had to KEEP CALM AND KNOW IT WILL BE OKAY. And it was. And she cheerfully went off to play. And when she ran ahead and placed her hand next to a sliding door and it opened on her arm up to her elbow I pushed the door back and hugged her tight. I wanted to be so angry with myself for looking away and letting another incident happen in the same day. I wanted to give up on my shopping list. But I asked her to wiggle her fingers and bend her wrist and wave her arm. She cried. Of course. But I had to KEEP CALM AND BELIEVE I'M A GOOD MOM. And I am. And we continued into the store where she happily asked questions and straightened shelves and helped me locate items. KEEP CALM AND HAVE PATIENCE. I will have patience with her because she is unceasingly learning and growing. I will have patience with myself because I am still learning and growing. I will have patience with life because then, and only then, can I concede to letting it make us who we are actually destined to be. KEEP CALM AND LIVE LIFE TO THE FULLEST.